New York: Harper Audio, 1996. 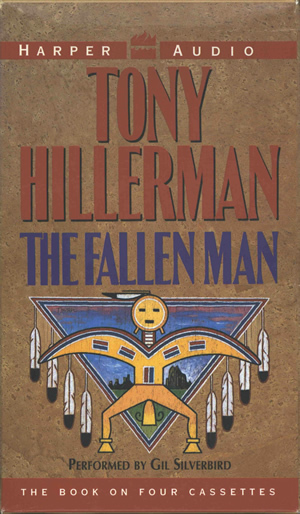 This is the abridged audiobook version of The Fallen Man, performed by Gil Silverbird, published by Harper Audio in 1996. It is recorded on four cassettes with a listening time of approximately 6 hours. The cassettes are in a beige paperboard case with Peter Thorpe's original cover art for this title. The author's name is printed in red, with the book title in purple. The illustration is a representation of a Navajo Yei figure in front of an upside down triangle with feathers hanging from the sides. Inside the triangle are some sandstone formations on one side of the Yei figure and Ship Rock mountain on the other side, below a sky with clouds and New Mexico sunset coloration at the top. The back of the case contains a synopsis of the novel printed in black, and the author's and performer's biographies, printed in red. The publisher information and bar code are at the bottom of the back cover. Both sides of the case display the author's name printed in red, the book title in purple, the publisher's imprint, and fiction designation.